You are currently browsing the tag archive for the ‘wildlife invasion’ tag. 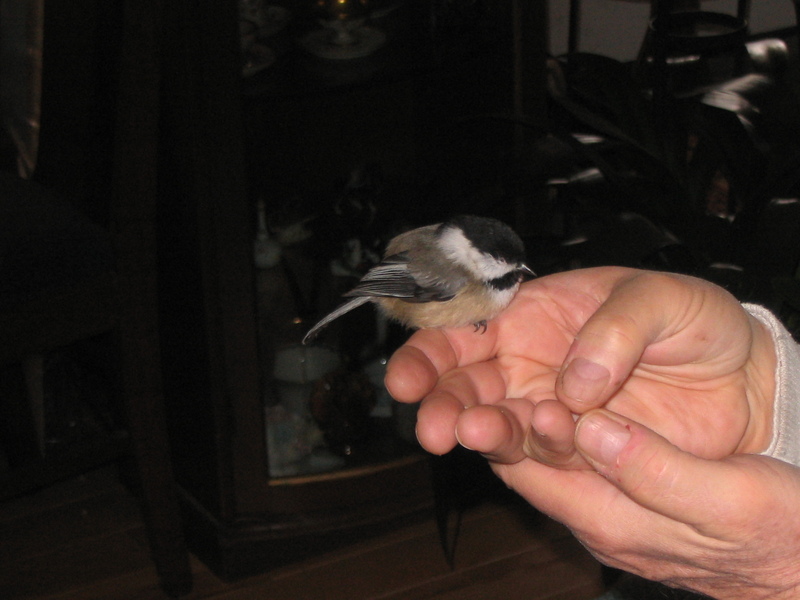 A few days ago Fred came in carrying a chickadee. Bill saved it and took it into no cat territory, placing it in a box by the fireplace. The next day it climbed onto his hand and refused to go back in the box. It had a few Fred marks, but obviously was okay. Bill put it back in the box overnight and the next day took it outside. At first it wouldn’t fly away, but then changed its mind. Freedom is more important than a warm place and free food. Cats and birds don’t mix, even when someone (Bill) thinks they do. He should have watched more Sylvester and Tweety cartoons when he was a kid. Cats never give up.